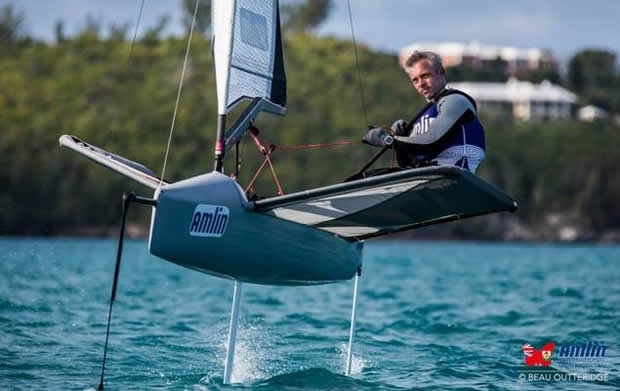 Rob Greenhalgh today stamped his dominance on the inaugural Amlin International Moth Regatta, hosted by the Royal Bermuda Yacht Club. Lying in second overall entering the day, Greenhalgh won all three races to win the championship and the winner’s share of US$5,000 of the $10,000 prize purse. With the 6-12 knot winds right in Greenhalgh’s wheelhouse, he dominated today's three races. His first victory was by nearly one minute, the second by 1 minute 30 seconds. He left little doubt as to who the best Moth sailor was this week. In a near repeat of last summer’s European Championship, Greenhalgh overcame regatta leader Chris Rashley for the victory. Rashley led Greenhalgh by 1 point entering today, but finished 8 points in arrears in the final standings after scoring 10-4-4 today. The 10th wound up being one of Rashely’s discards and he won $2,000 for finishing second. “It was nice to lead for a couple of days but I expected Rob to win today. He really excels in those conditions. He’s quicker in the mid-range stuff." After the two leaders a pair of America’s Cup sailors battled it out for third and fourth: Paul Goodison of Artemis Racing wound up pipping Chris Draper to third place by two points and won $1,500, while Draper won $1,000 for fourth place. Draper's bronze-medal winning 49er crew, fifth-placed Simon Hiscocks won $500. Greenhalgh dominated in part because he’s put in a lot of work on his set-up. Today he was riding on his large foils because of the lighter winds. With the large foils it’s easier to get up on them and stay on them through tacks and gybes. As soon as a boat drops off the foils it loses significant speed. Greenhalgh also used a canting rig system today. The system doesn’t cant the rig to windward. Instead it allows the rig to stand up more vertically relative to the water, which generates more boat speed.